This helmet is a particularly fine example of the iconic symbol of the Military Forces in colonial NSW. It has a cork or 'pith' body covered with bleached and pipe-clayed cotton canvas. The plate is the NSW Military Force General Service Badge comprising a waratah wreath enclosing St George's Cross with a Southern Cross constellation embossed on it. In the centre of the cross is a lion passant. At the top of the badge is Queen Victoria's crown. The badge is backed with red cloth. This badge was adopted in the early 1880s and remained in service until the Queen's death in 1901. The top of the helmet has a fluted spike on a circular base. The spike and the badge are made of nickel alloy 'white metal'. The white metal has a superb even patina. A line of chin scales are looped across the front of the helmet. They are made of gilt metal stitched to a leather strap. 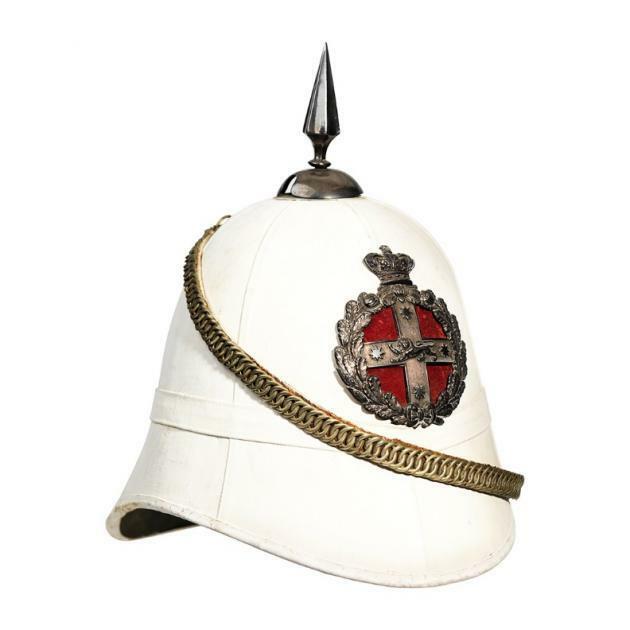 This helmet is an Other Rank's pattern worn by the men of the NSW Military Forces from around 1880 to the first decade of the 20th century. This helmet is a particularly good example and is rare in that it is colonially made. Inside the helmet crown is a paper maker's label indicating that the helmet was made on Oxford Street, Sydney. Most military headdress of this quality, worn in the Australian colonies, were made by Hobsons and Sons of London, or similar English makers, and imported. The NSW Military Forces were created in 1878 after the British garrison had withdrawn from the colony. This was one of the first style of headdress adopted. There is a rich body of documentary and photographic evidence of helmets like this being worn by the NSW Military Forces through the period spanning the Russian scare of the 1880s and the negotiations for a united colonial defence force in the build up to Federation in 1901 in which the NSW Military Forces played a major role.